Stuck in Wordbrain 2 Literature (Word Savant 6×7). Here are the answers. 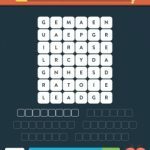 where are the answers for wordbrain decoder literature 8×8 lev 1-5? I love this game but if I can’t move past 97 % it is pointless. Zell the hard work up until now is wasted. I won’t play any games if You can’t sort this. On some of these puzzles I had to answer them in reverse order.